The interview of Andrew Schumann, the managing editor of Studia Humana, with Andrej Ule, Professor of Dept. of Philosophy, Faculty of Arts, University of Ljubljana, Slovenia. Interview: Is Logic Ever Foundational? The interview of Andrew Schumann, the managing editor of Studia Humana with András Máté, the head of Dept. of Logic, Faculty of Arts and Humanities, Eötvös University Budapest, Hungary. The interview of Andrew Schumann, the managing editor of Studia Humana with Péter Szegedi, Pofessor at the Department of History and Philosophy of Science, Eötvös University, Hungary. Interview: P-Adics: Mathematics For Sigmund Freud? 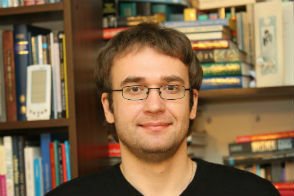 The interview of Andrew Schumann, the managing editor of Studia Humana, with Andrei Krennikov, professor of applied mathematics at Linnaueus University, South-East Sweden, the director of the International Center for Mathematical Modeling in Physics, Engineering, Economics, and Cognitive Science. Interview: One Day Post-Soviet Countries Will Rise Up? The interview of Andrew Schumann, the managing editor of Studia Humana with Andrew Wilson, a Senior Policy Fellow at the European Council on Foreign Relations. Interview: Can an IT-Company like Apple Be Established in Belarus? The interview of Andrew Schumann, the managing editor of Studia Humana with dr. Valery Tsepkalo, the Director of Hi-Tech Park Administration (Minsk, Belarus). Interview: Libertarians in Russia: Moscow Never Sleeps? The interview of Andrew Schumann, the managing editor of Studia Humana with Anatoly Levenchuk, President of TechInvestLab.ru and Victor Agroskin Vice-president of TechInvestLab. The interview of Andrew Schumann, the managing editor of Studia Humana, with George Kiraz, the founder of Beth Mardutho (formerly The Syriac Computing Institute) and Gorgias Press. The interview of Andrew Schumann, the managing editor of Studia Humana, with with Basil Lourié, the editor in chief of the Scrinium. Revue de patrologie, d`hagiographie critique et d`histoire ecclésiastique published by Gorigais Press and of its two supplement series: Orientalia Judaica Christiana and Scripta ecclesiastica. One of the main assumptions of mathematical tools in science is represented by the idea of measurability and additivity of reality. For discovering the physical universe additive measures such as mass, force, energy, temperature, etc. are used. Economics and conventional business intelligence try to continue this empiricist tradition and in statistical and econometric tools they appeal only to the measurable aspects of reality. However, a lot of important variables of economic systems cannot be observable and additive in principle. These variables can be called symbolic values or symbolic meanings and studied within symbolic interactionism, the theory developed since George Herbert Mead and Herbert Blumer. In statistical and econometric tools of business intelligence we accept only phenomena with causal connections measured by additive measures. In the paper we show that in the social world we deal with symbolic interactions which can be studied by non-additive labels (symbolic meanings or symbolic values). For accepting the variety of such phenomena we should avoid additivity of basic labels and construct a new probabilistic method in business intelligence based on non-Archimedean probabilities. form of reflexive management language. deal with non-well-founded data such as infinite streams. The purpose of the workshop Philosophy and History of Talmudic Logic held on October 27, 2016, in Krakow, Poland, was to examine the meaning of Talmudic hermeneutics in the contemporary epistemology and logic. One of the main features of Judaism is that Jewish religious laws are not dogmatic but based on specific legal reasoning. This reasoning was developed by the first Judaic commentators of the Bible (Tann’ayim) for inferring Judaic laws (halakah) from the Pentateuch. Our workshop was aimed to consider Judaic reasoning from the standpoint of modern philosophy: symbolic logic, rhetoric, analytic philosophy, pragmatics and so on. On the one hand, we are interested in possibilities to import into the Talmudic study modern logical methods. On the other hand, we are interested in possibilities to export from the Talmud new logical principles which are innovative to contemporary logic. Greek logic was established within a Babylonian legal tradition, as well. grounded in the Sumerian/Akkadian jurisprudence. unconsciously satisfy the centre’s goals. It is a Preface to Volumes 7:3 and 7:4 (2018) consisting of articles presented at the International Interdisciplinary Conference Ideas and Society on the 150th anniversary of the birth of Leon Petrażycki, held on November 24, 2017, in Rzeszów, Poland. In decision making quite often we face permanently changeable and potentially infinite databases when we cannot apply conventional algorithms for choosing a solution. A decision process on infinite databases (e.g. on a database containing a contradiction) is called troubleshooting. A decision on these databases is call d creative reasoning. One of the first heuristic semi-logical means for creative decision making were proposed in the theory of inventive problem solving (TIPS) by Genrich Altshuller. In this paper, I show that his approach corresponds to the so-called content-generic logic established by Soviet philosophers as an alternative to mathematical logic. The main assumption of con tent-genetic logic is that we cannot reduce our thinking to a mathematical combination of signs or to a language as such an d our thought is ever cyclic and reflexive so that it contains ever a history.